Fundamental change can and does happen, by the slow accumulation of many advances done by a great many people. The more bodies we have in the room, the more we may start those accumulations. 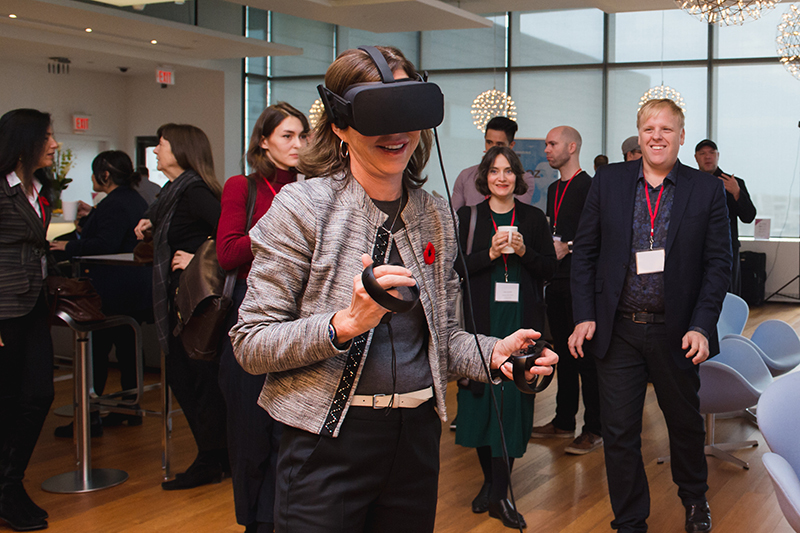 Kareen Rispal, Amabassador of France in Canada, does a demo of MasterpieceVR, the Canadian 2017 Cultural Start-up Award recipient. Who should be in the room to develop, design and have these experiences? How will these technologies develop, and will they go mainstream or fade to black? What are the ethical and political effects of these technologies, to heighten empathy and build community, or erode privacy and entrench biases and fears? What will the emerging grammar of platform-agnostic storytelling look like? Can it transform us and if yes, for better or worse? 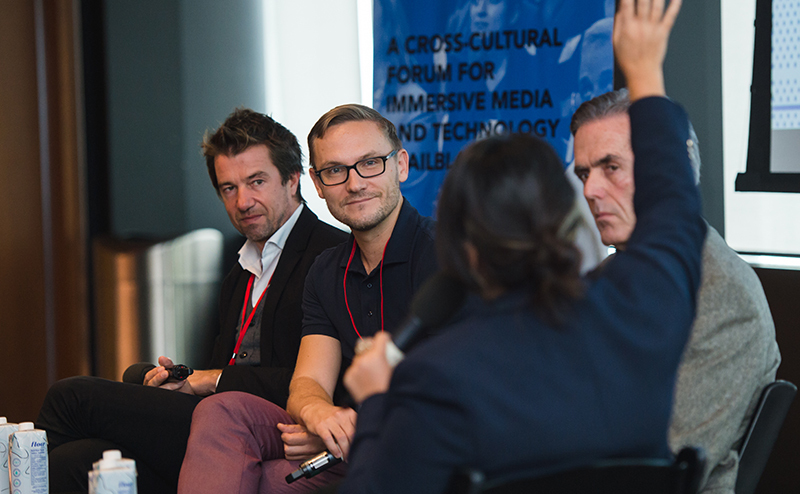 On October 31 and November 1 at Corus Quay in Toronto, the CFC Media Lab hosted Enterprising Culture, an international forum on new immersive media technologies in France and Canada. It delved into these questions by gathering high-level French and Canadian influencers, entrepreneurs, investors, government representatives and academics for debates, demos, pitches and networking. A powerhouse of female leaders delivered opening remarks at Enterprising Culture 2017, including The Honourable Eleanor McMahon, Ontario Minister of Tourism, Culture and Sport (centre); Ana Serrano, Chief Digital Officer, CFC (left); Brigitte Proucelle, Cultural Counsellor, Embassy of France in Canada (right); and Monique Vialitou, President and CEO of BNP Paribas (not pictured). Presented by CFC Media Lab and the Cultural Service of the Embassy of France in Canada, in partnership with BNP Paribas and La Gaîté Lyrique, Enterprising Culture showed, as the Honourable Eleanor McMahon noted in her opening remarks, "how creative ideas take root." 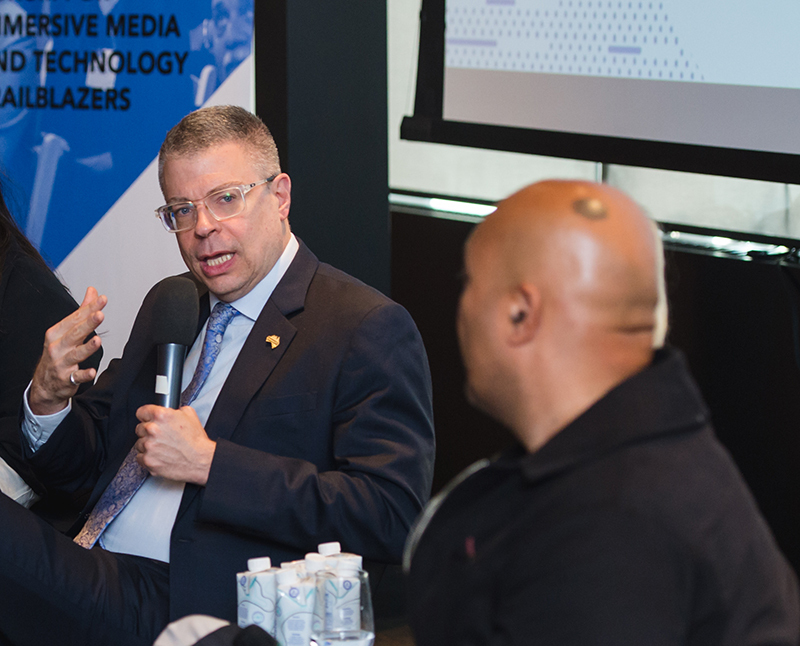 Its discussions proved that contemporary immersive media technologies are “taking root” as a new mode of creativity and a new zone for economic development and investment. Canadian and French broadcast media and organizations are embracing immersive media and platform-agnostic storytelling more. Below are some highlights and photos clustered under these three topics, topics that connected, diverged and framed a complex conversation. In Canada, events now typically start with a brief acknowledgment that the land on which the event takes place belongs to specific Indigenous populations who predate Western and European settlers’ arrival by centuries. Usually that marks the end of the discussion. Not at Enterprising Culture. The opening land acknowledgment framed a point of departure for a more extended, in-depth discussion not often seen in the startup space. 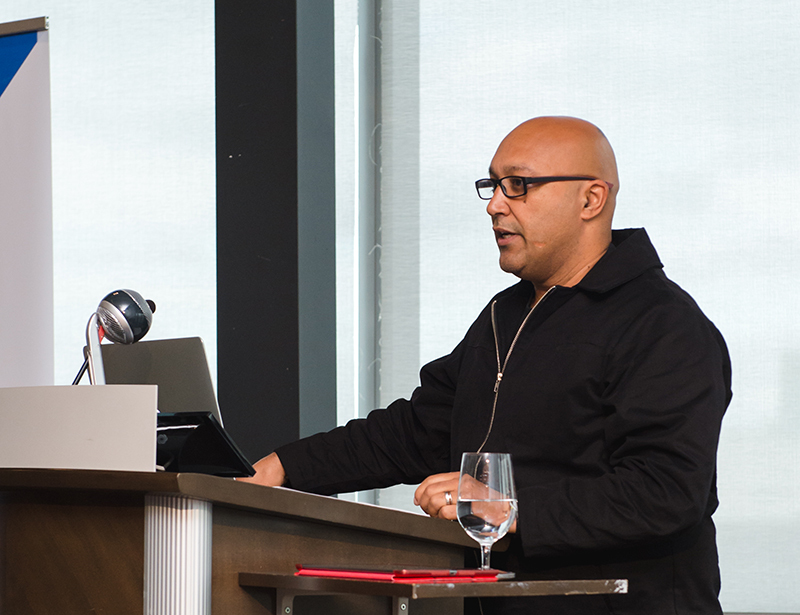 Several speakers returned to the nuances of diversity, inclusivity and specifically, how Canada’s Indigenous populations can inform and transform how immersive media technologies are made. Jason Edward Lewis of Concordia University set the tone for the event in his opening keynote. He traced a genealogy of early VR works by Indigenous artists in the 1990s, such as Loretta Todd and Lawrence Paul Yuxwelupton, works that were “political, embodied and grounded in the land.” They provided, and still do provide, an alternate to what VR has become – "safe, depoliticized fantasies of command and control." Keynote Jason Lewis, University Research Chair in Computational Media and the Indigenous Future Imaginary, Concordia University. He discussed how science fiction lacks Indigenous peoples as characters, making them literally un-imaginable in the future. Indigenous-made VR like '2167,' ImagineNative’s commissioned set of pieces by Indigenous artists for the 2017 Toronto International Film Festival, can counteract this erasure. Anita Lee of the National Film Board (NFB) (and CFC mentor), Stephane Cardin of the Canada Media Fund (CMF) and Sadia Zaman of the Royal Ontario Museum (ROM) extrapolated on Lewis’ inquiry. They called for more inclusive hiring, mentorship and jury practices in immersive media. As these technologies evolve, they noted, Canadian companies and organizations must begin to incorporate more Indigenous makers, developers, storytellers and users at all levels. Specifically, Lee discussed the NFB’s investment in incubating production support and mentorship for a more diverse and cross-cultural group of Canadians, which would include, centrally, Indigenous creators. She also cited Open Immersion, a joint NFB-CFC Media Lab workshop introducing visual and performance artists of colour in the U.S. and Canada to VR. Cardin described some of the CMF’s Indigenous programming initiatives and their forthcoming Indigenous Screen Office as a comparable investment in encouraging inclusion. Zaman outlined the ROM”s ongoing “experiment” of working with the Ontario College of Art and Design’s Indigenous Cultures and Digital Futures programs to tell stories about the objects in the museum, or the recent exhibit, “Family Camera,” for which OCADU students generated an immersive experience about cross-cultural family photography practices. 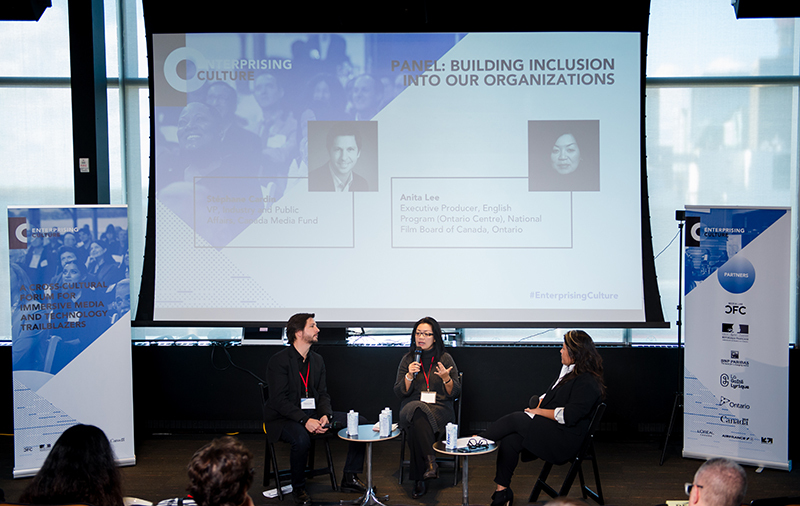 Anita Lee, Executive Producer, English Program (Ontario Centre), National Film Board of Canada (speaking in centre), and Stephane Cardin, VP, Industry and Pulic Affairs, Canada Media Fund (left) with moderator Ana Serrano, Chief Digital Officer, CFC (right), on building inclusion in immersive media-making organizations. Ultimately, these speakers reminded us that we are only in the early stages of shaping a more inclusive vision on, behind and before our screens, both in Canada and France. It is, at present, an experiment whose outcome and effects remain not yet fully known. Ana Serrano noted at the outset that creative, media and cultural industries are critical to technological innovation and economic development in France and Canada. As nations, we share similar values about the role of culture in society – one of the reasons for the CFC partnering with France’s BNP Paribas, La Gaîté Lyrique and the Embassy of France in Canada on this event. Several panelists explored how this affinity is playing out (or not) in investment and funding strategies for the creation, production, distribution and exhibition of immersive media experiences in France and Canada. Representatives of national and provincial governments, media arts organizations, and venture capitalists shared their thoughts on investment in immersive media today, pre-mainstream. This topic was of special interest to the 10 startups vying for the Cultural Start-up Award, who took full advantage of the day to build their own network with potential investors. The Cultural Start-up Award, sponsored by Founding Partner BNP Paribas, was held on November 1 as part of the event. This pitch competition for 10 companies – five from Canada, five from France – were all based in arts and culture-based immersive media. Ultimately the jury selected Canadian company MasterpieceVR and French company Histovery for the prize; each will travel to, respectively, La Gaîté Lyrique in France and the CFC’s IDEABOOST Accelerator in Canada for commercialization services. Discover all of the finalists here. Enterprising Culture enabled numerous formal and informal opportunities to make investment connections – a key goal of its international organizers. Two presentations on the current and projected state of funding for VR in France and Canada kicked off Day Two. Agnès Alfandari of Institute Français described the website, CultureVR.fr, which showcases VR artwork, talks and an emerging network of producers. Next up was Kristian Roberts of Nordicity, who described some highlights of the CFC Media Lab and OMERS Ventures-backed ongoing study, Pulse on VR: A Living Ecosystem, seen at pulseonvr.ca. Alfandari and Roberts made clear that the mainstreaming of VR is starting. We are coming out of the trough of disillusionment that followed an initial, uncritical rush. Something more grounded and real is developing now, especially in location-based entertainment VR. Mainstreaming VR and AR will likely occur within the next two to five years, and is already underway in the Asia-Pacific region. Immersive Media Investors panel (left to right): Prashant Matta, Venture Fund, OMERS Ventures; Nicole LeBlanc, Director, Strategic Investments and Women in Tech, BDC Ventures; Sunil Sharma, Techstars Toronto; and moderator Dominic Bortolussi. The Immersive Media Investors as a panel captured these shifts, which are playing out on the ground for investors. 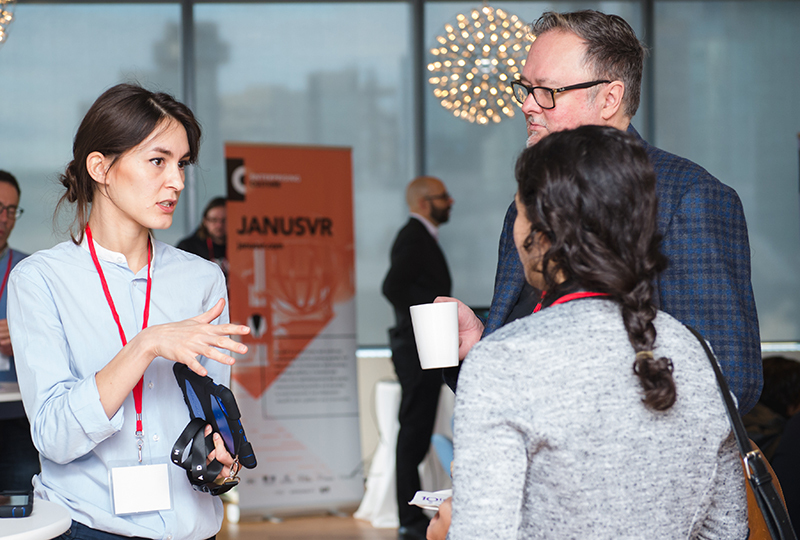 Dominic Bortolussi of The Working Group, Nicole LeBlanc of BDC Ventures, Prashant Malla of OMERS Ventures and Sunil Sharma of Techstars Toronto outlined their investment strategies for immersive media companies. One takeaway: LeBlanc noted that for BDC, having an established revenue stream wasn’t as necessary as having an understanding of the pain point to solve, which makes scaling more accurate and gaining revenue down the line easier. This discussion revealed that investing in VR content production is riskier than in products and tools. Most non-VR filmmakers know how difficult it is to raise capital for projects. Still-unproven technologies like VR, AR and MR raise the stakes even higher. Higher, but not impossibly so. The panels “Cultural Institutions Meet Immersive Media” and “Broadcast Meets Immersive Media” demonstrated that organizations and broadcast media in Canada and France are, to varying degrees, beginning to invest in immersive media technologies to tell platform-agnostic stories – both fiction and non-fiction, especially news and documentary. Along with Priam Givord, Art Gallery of Ontario curator Lisa Ellis introduced Small Wonders: The VR Experience, a co-production of CFC Media Lab, Seneca College of Art and Animation and the Art Gallery of Ontario. 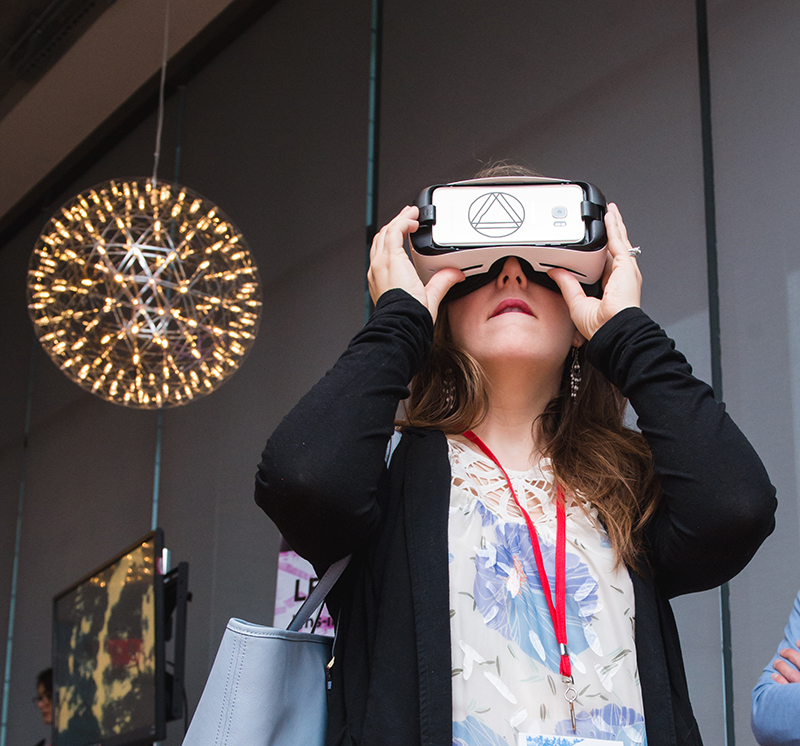 It was the AGO’s first use of VR in a major exhibition and a huge success, which shows how VR is investment-worthy, not only in entertainment, but in education that extends, not replaces, real-world engagement. In Canada, as several panelists discussed, there remains internal uncertainty over – or in some places, outright resistance to – investing in these new technologies. Overall, the CBC and Canada Council remain more reticent than their French counterparts to invest on the same scale. Chris Harris of the CBC spoke candidly about how much the broadcaster is dealing with internal uncertainty about how to invest in immersive media. During post-panel discussions, several French and Canadian audience members challenged this reticence, citing the other European and American broadcasters, like The Guardian or The New York Times, who have both made the leap and are integrating immersive media in digital news journalism. Chris Harris, Director of Digital Content, Programming, CBC (centre), with Morgan Bouchet, VP, Innovation and Digital Content, Orange (left) and Glenn O'Farrell, President and CEO, TFO (right) of Broadcast Meets Immersive Media panel. Similarly, the Canada Council recently adopted its highly touted Digital Strategy Fund, but Sylvie Gilbert, its director, noted that this funding is not available for programming. Rather, it’s funding organizations to better develop their own digital strategy – one that may or may not include immersive media. The CBC and Canada Council approaches differed from that which several of the French panelists spoke, like Michael Swierczynski of Forum des images, Morgan Bouchet of Orange, and some of Alfandari’s examples in her overview of contemporary VR in France. As Swierczynski and Emma Butin of La Gaîté Lyrique mentioned, French funding may often come from outside of France and its public sector too. Beyond what took place “officially,” Enterprising Culture offered plenty of opportunities for attendees, whether investors, funders or startups, to speak with each other informally – exactly the kinds of networking that leads to deals. On both days, finalists for the Cultural Start-up Award set up demos, which gave everyone a chance to engage with immersive media and be more hands-on. That demystified the technologies being discussed, which can also lead to funding and investment. Overall, Enterprising Culture provided a staging ground, not only for conversations about investment strategies, but also, on-the-ground forms of investment to take root, too. Mathilde Michaut, Operations Manager of Histovery, which was the French recipient the 2017 Cultural Start-up Award. Michaut explains and demos Histovery's augmented reality museum engagement tool, Histopad, to Enterprising Culture attendees during a coffee break. In addition to examining inclusion and investment, Enterprising Culture brought Jason Edward Lewis and two other major thought leaders to the stage. Keynote speakers Mark Pesce of the University of Sydney and Heidi Boisvert of the City University of New York built on Lewis’ opening-day work to situate startup discussions in the big-picture context. Pesce and Boisvert both took Lewis’ call with a discussion of the ethics and political effects of technological innovation seriously, arguing for immersive media technologies’ capacity for empathy and good, and for an eroded public good and digital privacy. Pesce’s “The Last Days of Reality” began with a provocative, accurate claim: that we, through our engagement with our smartphones and social media (Facebook especially), are “thoroughly owned.” Pesce is no simple technophobe, calling for its rejection. Yet he detailed how, and how much, we have eroded our digital and increasingly non-digital forms of privacy through our devices. Facebook answers more to its shareholders than any public good. Its calls for “more user engagement” obscure its real aim: shaping a pervasive and largely unchecked culture of digital surveillance, which erodes not only a digital public sphere of the Internet, but also, and by extension, in-person public space. Keynote speaker Mark Pesce, Honorary Associate, University of Sydney (left), with keynote speaker Jason Edward Lewis, University Research Chair in Computational Media and the Indigenous Future Imaginary, Concordia University (right). The use of AR-based Pokemon Go, he argued, illustrated how AR will increasingly infiltrate and overtake non-digital public spaces. It will de-territorialize and render them as spaces not for the public good (e.g., playing Pokemon Go and taking disrespectful selfies at Holocaust memorials). Here, the real world becomes a colony, not Lewis’ tool for de-colonizing. It contributes to the ever-increasing silo effect of people not listening to or engaging with racial, gendered, sexual and political perspectives that deviate from their own. Pesce began his talk by noting it was the anniversary of Martin Luther’s founding manifesto of the original Reformation, and then asked: who could lead us in a new digital reformation, to challenge the increasingly consolidated forms of social and political control we’re slipping under. Unless we answer to a culture of our own, he warned, we will be forced to answer to, and live with, someone else’s unchecked view. We need to start judging technology by its capacity for ill effects, not presuming that its capacity for good will prevail, he said, and furthermore, too often companies don’t assume a logic of permission in advance of development – preferable to a philosophy of regret after the fact, when the damage is already done. Closing keynote speaker Heidi Boisvert, Assistant Professor, Director of Emerging Media Technology, City University of New York. 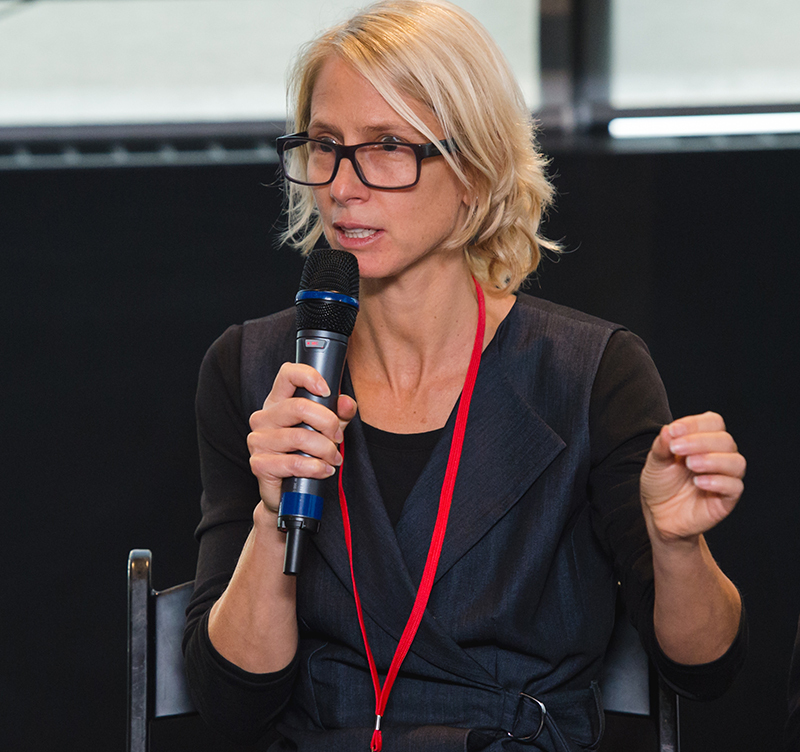 Boisvert engages directly with neuroscience in her work. She showed several examples of pieces in which users, performers and viewers alike physically and cognitively re-experience technologies. Like Pesce, she discussed how much our reliance on digital screen-based technologies is rewiring our brains. We now recognize our computer screens with greater accuracy than we do human faces. In an interesting synergy, several of the Cultural Start-up Award companies were already adopting these approaches outlined by Boisvert. Histovery, the French award recipient, had created “Histopad” to employ AR in the service of reimagining and enhancing the user’s experience of cultural heritage as more human-scale. Canadian finalists Filmtyme, by working in the health sector, sought to demystify medical procedures through VR. French VR content producers GengiskhanVR, VRTUOZ, Red Corner and Novelab all invoked “empathy” as a guiding principle of their storytelling work. Enterprising Culture 2017: Mark Pesce Keynote from Canadian Film Centre on Vimeo. In conclusion, Enterprising Culture and especially its three keynote speakers framed the event by reminding us that the capacity for good and evil embeds in most technologies. The trick is to know how to frame them, for whom, and to what ethical ends. In this respect, Enterprising Culture asked us – as users, makers, investors, audiences and funders – to explore, in Jason Edward Lewis’ words, what our responsibilities to each other are, as we engage with these new and still-evolving technologies. Perhaps, as Boisvert suggested, we have not yet become too much like the devices we use, scripted only for certain protocols and unable to see others. Immersive media technologies could make us slip further down a solipsistic silo, where all we see is what’s in our individual headsets. Or we might use these technologies to flip the script. The goal, as many of Enterprising Culture’s conversations tracked, was to hold a space for discomfort and “big” as well as granular questions in technological innovation, with a humanist endgame of generating more empathy in a truly more inclusive, immersive world.